Gamers may not be so hyped with the arrival of Valentine’s day however Treyarch has just made a compelling announcement of releasing a massive 2XP event that will traverse through all three modes: Blackout, Multiplayer and Zombies. 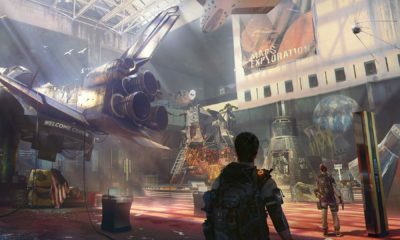 Critics are saying that this is may be an effort to bring back some players from a freshly released Battle Royale game: Apex Legends; which has taken the gaming world by storm. Treyarch released their last 2XP event only a few weeks ago in Black Ops 4 but this time they are offering something big in their latest event. Usually these types of events focus on specific game modes like only Zombies or only Multiplayer. 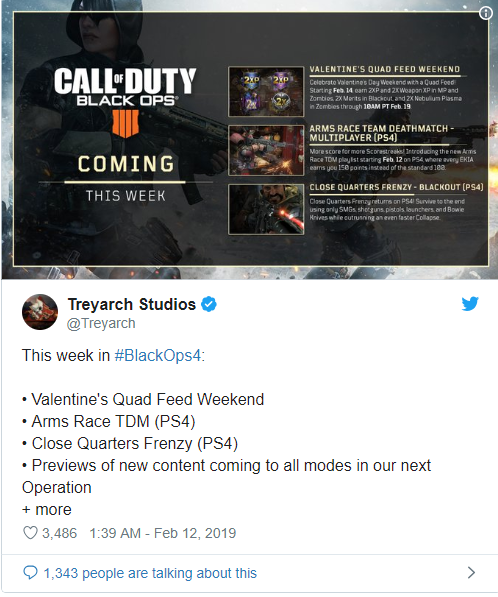 Good thing about Valentine’s day Quad Feed event is that it will encircle all three modes in the game. The event will start at 10am PST / 1 pm EST / 6pm GMT and will continue till February 19 for every time zone leaving enough time for gamers to feed on their hunger with this double reward event. 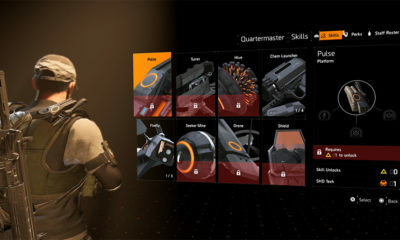 Most awaited feature of this event is surely 2XP Multiplayer as it will allow players to do some Prestige grinding as well as to unlock new camos and attachments for their weapons. 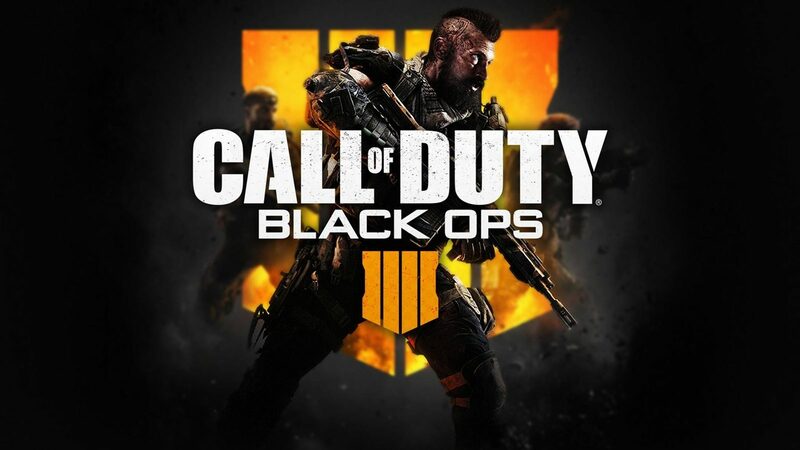 Quad XP event whether it is in Black Ops 3 or Black Ops 4, is may be your only chance to increase level of such weapons which you find difficult to use without attachments like “MOG 12”. 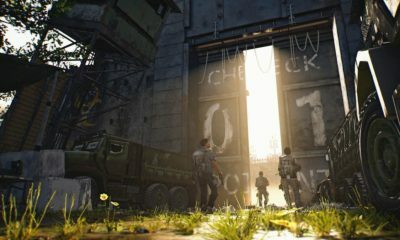 If you are more of a Blackout player, don’t worry as the Quad event will also bring 2XP Merits to the battle royale mode. Perhaps it is an attempt to bring back players from Apex Legends. Nonetheless you will get double experience during the event. Zombies players will receive a “triple” event during Quad feed. There will be 2Xp event for Prestige levels, Weapons and lastly Nebulium Plasma will also receive 2XP during this Quad event. Well if all of this was not enough for you, Treyarch released a tweet stating that Close Quarters Frenzy mode will also be live during Quad event. It is a pity that PC and Xbox players won’t be able to play it as Close Quarter Frenzy will be launched for PS4 only. This is a blackout mode in which the circle collapses much quicker. Weapons are limited to SMG’s Shotguns and Handguns. Treyarch has yet to confirm whether this event will go live with Valentine’s day Quad feed or not. PS4 will also receive an event called “Arms Race Team Death Match” which will go live on 12th of this month.